The Shrine of Fatima presented this Saturday the theme for the new Pastoral Year with an opening day, which was held at the Pastoral Centre of Paul VI. The chosen theme for the Pastoral Year is “To give thanks for the gift of Fatima”, announced today the Rector of the Shrine of Fatima, Fr. Carlos Cabecinhas. This period that starts now, was viewed by the Shrine of Fatima on the horizon of a triennium and the outlined itinerary proposes exactly to extend and deepen the Centennial of the Apparitions and promote the strengthening of the created dynamisms, providers of “such good fruits, under the aegis of the recognition of the gift received and the commitment for its welcoming”. Now finalized the Centennial and a seven year itinerary, the Shrine now opens a new three year cycle, generically named as “Time of Grace and Mercy”, which suggests a specific theme for each year. The first, in which we now enter, will be lived under the theme “Time of grace and mercy: to give thanks for the gift of Fatima”, points out the conscious of the received gift, gratuitous and loving initiative of God. The second, 2018-2019, will be lived in the light of the “Time of grace and mercy: to give thanks to pilgrimage in Church”, evoking the ecclesial dimension of this gift to the Church and to humanity, to the Church and to the world. Finally, the year 2019-2020, intoned by the vocation to holiness, gift and task, will be called “Time of grace and mercy: to give thanks for living in God”. With this pathway the Shrine wishes to recall the moments of grace which mark the centennial history of the Fatima event, looking to jog the conscience of the gift this event is to the contemporary times. 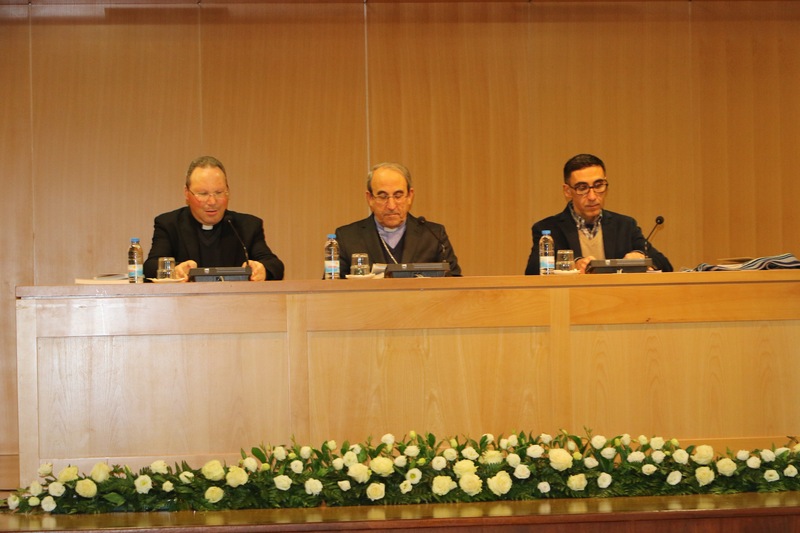 In the presentation of the new Pastoral Year, he advanced that the “great goals of this triennium” are based in “reminding the moments of grace along these 100 years of the Fatima event, to heighten the conscience that Fatima is a gift for the contemporary world and to emphasize the dimension of the ecclesial nature in the message of Fatima”. “To deepen the baptismal dimension of the message of Fatima, to value pilgrimage as an indication of the human condition and the pilgrim´s figure as the central character of the event of Fatima and to deepen the knowledge on specific sanctity models of Fatima”, are other defined objectives, said the Rector. Fr. Carlos Cabecinhas added that this new Pastoral Year will seek, “from a graphic point of view, to mark this theme with banners and other advertising material, to remind pilgrims of the theme” which guides Fatima. This way, it will be proposed “a prayer itinerary for pilgrims”, “a catechesis in the Prayers Area promenades regarding the theme”, and the book of the year, now as “The Pilgrim´s Guide”. Regarding the training level, Fr. Carlos Cabecinhas revealed that the “usual frequency of theological and pastoral symposiums” and “the frequency of conference cycles, although in a slightly different configuration” will be kept, being extended throughout the entire pastoral year. The cultural program “will not be as intense as it was in the last few years”, but the Shrine of Fatima intents to “keep the annual rhythm of temporary exhibitions”, because it is considered “a qualifying element of the message that is intended to be transmitted”. “We will reflect on the importance of Fatima as a place of culture – where culture has a place, where culture is produced and from where new cultural development axes irradiate- as well as its anthropological relevance, specifically before urgent welcoming challenges of the human sacrifice or the care for the Common House and the humanity living in it, according to a christian perspective integrated and integral”, he said. The Shrine´s Rector also stated that, after “celebrating festively and with intensity” the Centennial of the Apparitions, it is not possible to “simply end and conclude the celebrations, mostly, because 100 years of History are extended with other ephemerides”. To the triennium are also associated certain events which, even celebrated in their due dates, offer a transversal context to the three pastoral years: the restoration of the Diocese of Leiria, occurred on January 17th 1918; the death of Francisco Marto, on April 4th 1919; the edification of the Chapel of the Apparitions in the Spring of 1919; the death of Jacinta Marto on February 20th 1920; the building of the statue of Our Lady of the Rosary of Fatima that same year; and also, in 1920, the beginning of the pastoral work of Monsignor Jose Alves Correia da Silva as the bishop of Leiria. “We intend, not only in this pastoral year, but also throughout these three years ahead of us, to continue the dynamic initiated in the Shrine´s life by the celebration of the Centennial of the Apparitions. We will approach complementary themes which will help us to continue the reflection made”, informed Fr. Carlos Cabecinhas. The priest also revealed that the institution will “seize some of the dynamism that came along” so that “from now on, it can mark the Shrine´s life on a daily base”. “Looking carefully to the one hundred years of Fatima, we easily note that there are many demonstrative aspects of what the gift of Fatima is to the Church and to humanity. It is with that conscience that the Shrine will seek to live the coming years, starting with this one which succeeds the jubilee year, extending its joy and, in joy, deepening its fertility”, he also said. Fr. Carlos Cabecinhas added, that this year will be given “special attention to the Pilgrim Statue of Our Lady of the Rosary of Fatima, to understand the pastoral relevance, essential to the lives and contexts of the communities to which it is taken”. At the opening session of the new Pastoral Year, there was time to listen a reflection from theologian Jose Rui Teixeira, professor at the Catholic University and a performance from the Schola Cantorum, Little Shepherds of Fatima, directed by conductor Paula Pereira, as well as a speech from the bishop of the Leiria Fatima diocese. In the session, there were also awarded with the Centennial medal, five public institutions to which the Shrine wanted to pay tribute for their collaboration in this Centennial year, namely: the Ourem City Hall, the Fatima Parish Council, the National Republican Guard, the Voluntary Firemen Humanitarian Association of Fatima and Aciso - the Ourem-Fatima Business Association.